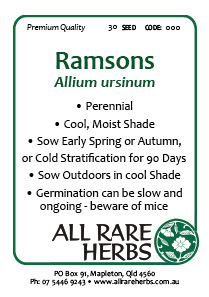 Ransoms, Allium ursinum, is also known as Wild Garlic, Wood Garlic and Bear Garlic. Ransoms is a traditional food in Europe being used in salad, as a spice or as a vegetable. The natural habitat is deciduous woodlands in moist, slightly acid soils. Flowering is in early spring, before trees come into leaf. Be the first to review “Ramsons, seed” Click here to cancel reply.